Charles Le Brun (1619-1690), Horatius Cocles Defending the Bridge (c 1642-43), oil on canvas, 121.9 x 171.8 cm, Dulwich Picture Gallery, London. Wikimedia Commons. If there is one phrase which epitomises the last year or so, it is fake news. It’s easy to get the impression that, until last year, everything which appeared in news media, the press, indeed publications of any kind, was totally factually accurate. That is, perhaps, the biggest fake news of all, as news has been notoriously riddled with errors and lies ever since people first started to communicate with one another. In this article and the next (tomorrow), I am going to look at two famous stories of ancient Rome, which have been depicted in some magnificent paintings. But in both cases, they are based on legends which are at least questionable, and quite possibly made up: gloriously fake news, if you like. My first is the story of the brave Roman soldier who stood and defended the city of Rome from attack by the Etruscans, fighting single-handed on the Sublicius Bridge: one Roman who personally saved the whole city, Horatius Cocles. Horatius was an unlikely hero, as they always are. When the army of the Etruscan king Lars Porsena marched on Rome from its base at the city of Clusium, it found the Romans ill-prepared and in disarray. It quickly seized the Janiculum, a hill outside the western walls of Rome, and then headed for Rome’s weak point, the Sublicius bridge over the River Tiber, which guarded the eastern edge of the city. The Romans were lined up ready for battle there, so the larger army of Etruscans drew up their line of battle ready to attack. By the time that the two Roman commanders had been carried away wounded, the Romans were starting to crumble. They then panicked, and headed for the bridge, where the Etruscans quickly got the better of them. It looked as if Rome was about to be seized by its enemy after only brief and feeble resistance. Animated GIF showing the first battle between Lars Porsenna and Rome at the Sublicius Bridge, in c 508/507 BCE. By Coldeel, via Wikimedia Commons. This is shown well in Coldeel’s animated GIF of the battle above. According to the legend, three Romans turned imminent defeat into success: Spurius Lartius, Titus Herminius Aquilinus, and Publius Horatius Cocles. These three formed a human barrier on the bridge, allowing the retreating Romans to pass back into the city, but blocking any progress by the Etruscans. 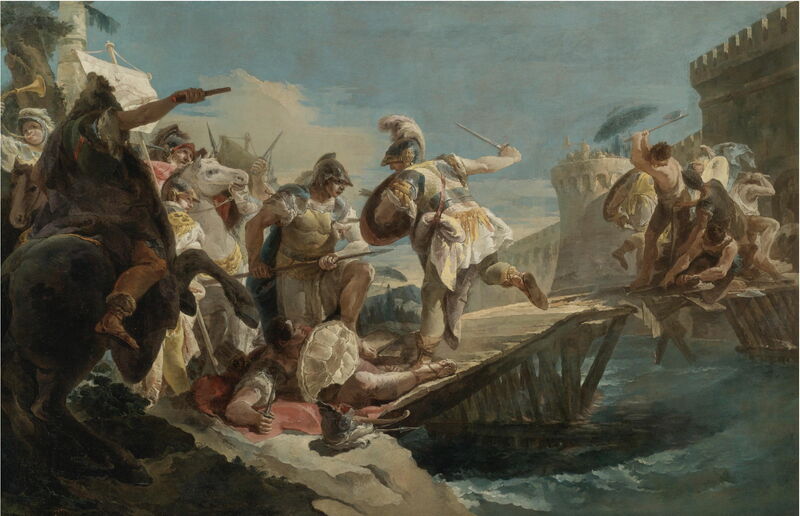 Following sustained attacks, Lartius and Herminius were forced to abandon their positions on the bridge, leaving its defence to Horatius alone. He instructed his fellow Romans to demolish the bridge from the Roman bank, and so prevent the enemy from using it to enter the city. While they did that, he continued to hold attacks at bay. Francesco Pesellino (1422-1457), Horatius Cocles Defending the Sublician Bridge (c 1450), tempera on sweet chestnut cassone panel, 43.5 x 134.6 cm, The Victoria and Albert Museum, London. Courtesy of and © Victoria and Albert Museum, London. Francesco Pesellino’s cassone panel showing Horatius Cocles Defending the Sublician Bridge from about 1450 is a magnificent and inventive depiction, which shows Horatius mounted on a horse. As there are at least two (possibly a third) figures of Horatius on his horse, this shows multiplex narrative. Master of Boccace of Munich (dates not known), Horatius Cocles Defending Rome (1542), BnF Français 273-274 Tite-Live de Versailles, fol. 49, BNF, Paris. Wikimedia Commons. This miniature by the Master of Boccace of Munich shows Horatius Cocles Defending Rome (1542). Unfortunately it places the site of demolition on the wrong side of Horatius, between him and the enemy, which would of course have changed the story completely. Elia Castello (1572-1602), Horatius Cocles Defending Rome (1602), stucco, dimensions not known, New Residence, Salzburg, Austria. Image by Wolfgang Sauber, via Wikimedia Commons. 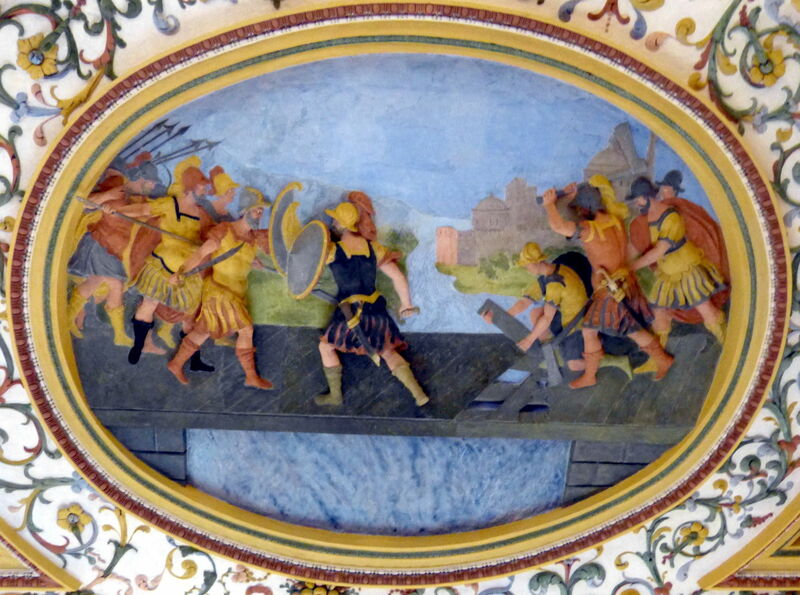 Elia Castello’s brightly coloured stucco of Horatius Cocles Defending Rome (1602), in the New Residence in Salzburg, Austria, is one of the earliest depictions which appears consistent with the Roman accounts. Even with such a narrow bridge, though, it begs the question as to how a single man could ever have fended off an entire army for the time that it took to break the bridge. 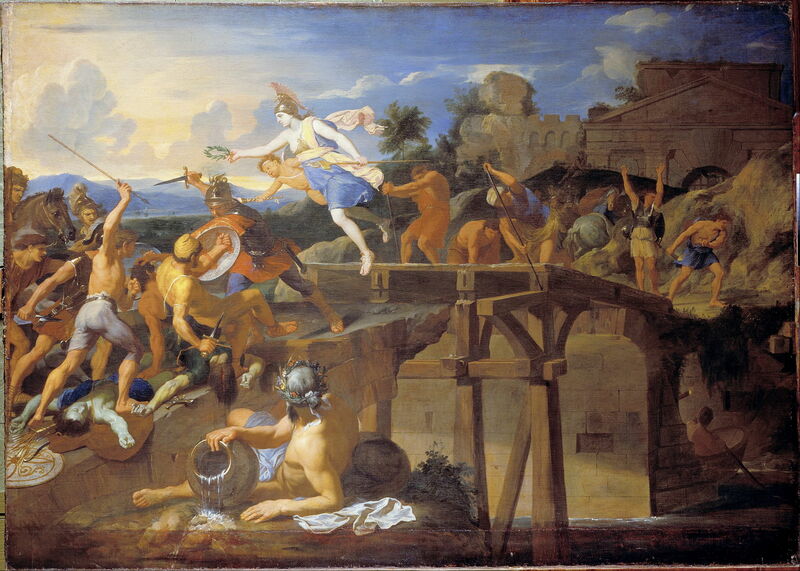 It is Charles Le Brun’s wonderful Horatius Cocles Defending the Bridge (c 1642-43) which I think first captures the story faithfully and brings it to life. Horatius is seen putting up his spirited fight on a stone pier on the side of the bridge opposite the city, as Romans are hastily removing a wooden bridge behind him. Above and behind Horatius, Minerva, goddess of battle, grasping her characteristic staff, holds a laurel wreath over Horatius’ head. In the foreground, the god of the River Tiber lounges on the bank, pouring water from his large flagon (which never becomes empty). It can only be a matter of minutes before the bridge is adequately broken, and Horatius jumps into the Tiber below. 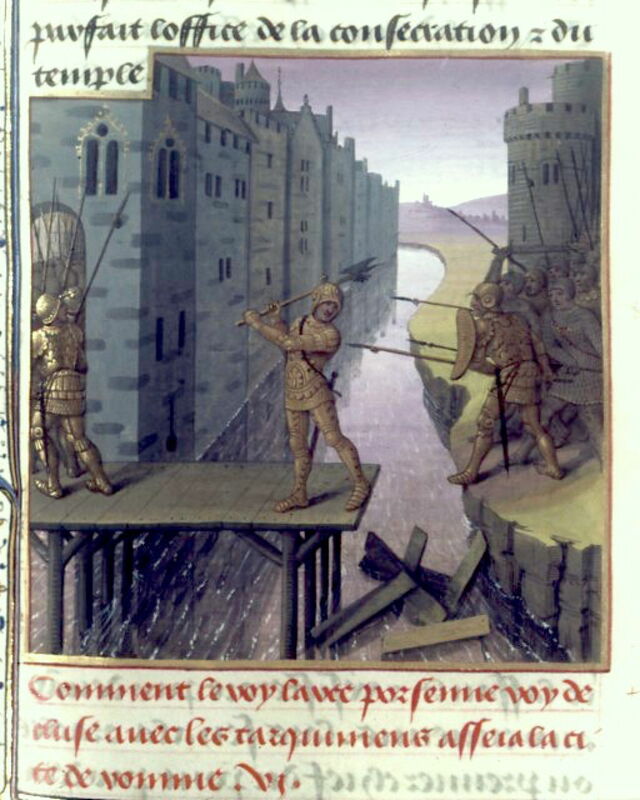 Once the bridge behind him had been demolished, with several significant wounds and still wearing his armour, Horatius Cocles knew it was time to get out. He jumped into the River Tiber and swam to the Roman shore, where he was welcomed as a great hero, and rewarded with the land that he was able to plough around in a day, which became the estate of the Horatius family. The Etruscans still laid siege to Rome, but on this occasion, around 509 BCE, did not occupy and sack it. Artist not known, Horatius Cocles Defending the Bridge (1542), painted ceramic, Urbino, Italy. Image by Sailko, via Wikimedia Commons. 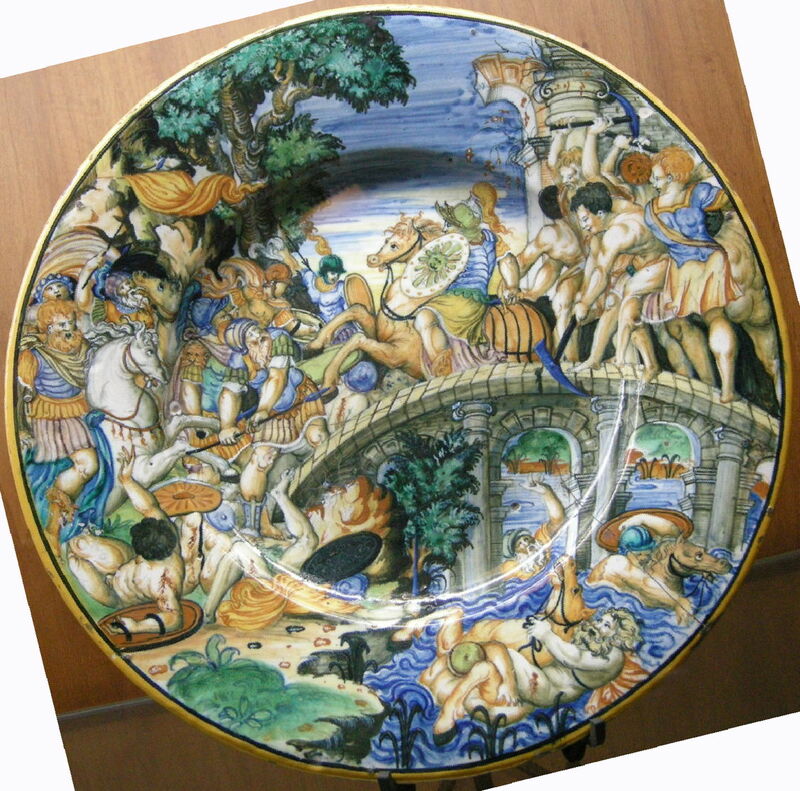 This plate from Urbino in Italy also uses multiplex narrative to tell its story of Horatius Cocles Defending the Bridge. The hero is again mounted on horseback, and its multiple images of Horatius in the Tiber seem to recognise the problems of trying to wear armour when in the water. Diana Scultori (1547–1612) after Giulio Romano (–1546), Horatius Cocles (c 1590), engraving, 24.8 x 27 cm, Los Angeles County Museum of Art, Los Angeles, CA. Wikimedia Commons. I have been unable to trace the original painting or drawing made by Giulio Romano (–1546) from which Diana Scultori (1547–1612) made her engraving of Horatius Cocles (c 1590). She too uses multiplex narrative, showing Horatius both on the bridge and in the Tiber. Unfortunately she also positioned the breach in the bridge between the Roman and Etruscan forces, rather than between the Roman forces – or more specifically Horatius Cocles – and the Roman shore. Unknown follower of Giovanni Battista Tiepolo, Horatius Cocles Defending Rome Against the Etruscans (date not known), oil on canvas, 137.2 x 208.3 cm, Private collection. Wikimedia Commons. This pair of paintings by an unknown follower of Giovanni Battista Tiepolo, above and below, used to be in Cleveland, OH, but were sold more recently. That above has been given the title of Horatius Cocles Defending Rome Against the Etruscans and below is The Wounded Horatius Cocles Swimming the Tiber. 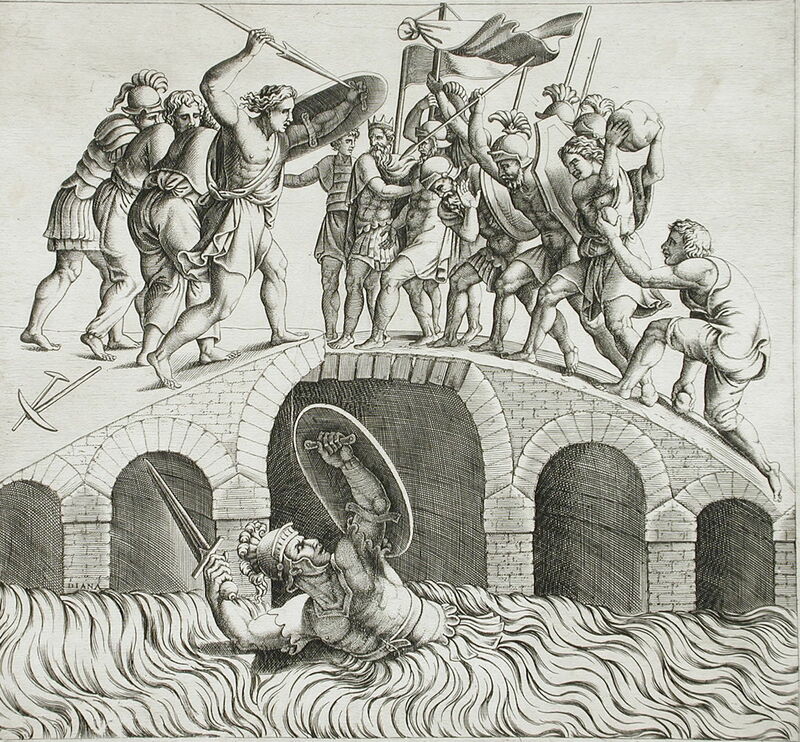 The Sublicius bridge is made to look quite flimsy and ad hoc, and when Horatius Cocles takes to the water in his armour, he floats even higher than if he had been wearing a lifejacket. 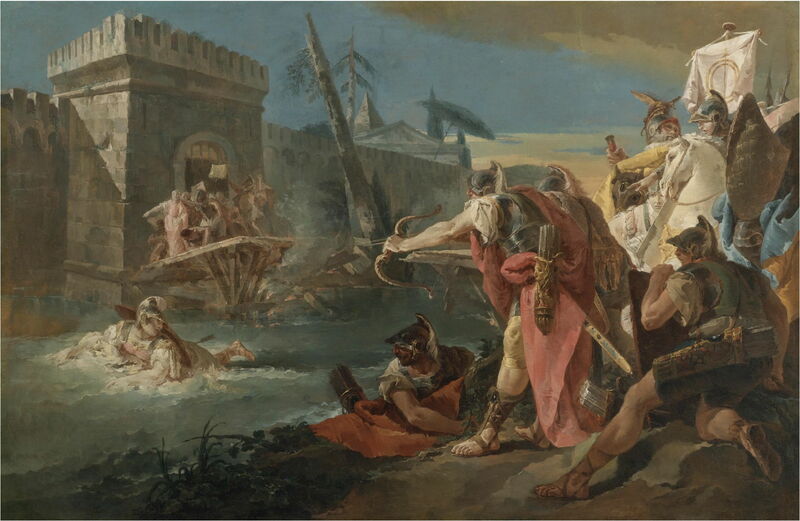 Unknown follower of Giovanni Battista Tiepolo, The Wounded Horatius Cocles Swimming the Tiber (date not known), oil on canvas, 137.2 x 208.3 cm, Private collection. Wikimedia Commons. Even the Romans who told the story of Horatius Cocles seem to have considered it more of a legend than accurate history. There are good arguments that it was a very successful attempt to hide the shockingly poor performance of the Roman army in a tale which held self-sacrifice ‘for the benefit of the state’ as a great moral virtue. It’s also a clever explanation for the family estates. Tomorrow I will look at another famous story concerning the Horatius family, from a much earlier age. Posted in General, Life, Painting and tagged Castello, Le Brun, myth, narrative, painting, Pesellino, Tiepolo. Bookmark the permalink. I have fixed an earlier problem with viewing the paintings at high resolution. My apologies for that.